Battery Powered Chemical Sprayer For Contractors! This new design can Spray Hydrochloric Acid based cleaning solutions and 10% Sodium Hypochlorite and Hundreds of other cleaners! Comes with Telescoping Wand 20"-50"
No Electricity or Heavy 12 volt Car Batteries! Use The 25' PVC Supply Hose included in the box, or a 2 Liter Bottle for chemical feed! Shoots a stream up to 30 feet! 2 Rechargeable Lithium Ion Batteries Included! Super quick charger can recharge a battery in one hour! Industrial grade Viton seals for long life! This sprayer is used in a variety of ways to apply Cleaners, Sealers, Disinfectants, Quaternaries, Mildewcide, Bactericide, Deodorizers, Insect Repellents and Weed control products, making it one of the most versatile and easy to use sprayers on the market! We also offer two different options that improve the performance and ease of use for contractors that value speed and better performance. Deck Cleaning: Apply deck cleaners, deck stains and sealers with ease. Rust Removal: Apply F9, Brick Clean and other acid based cleaners to remove rust. Degreasing: Apply degreasers to heavy equipment, engines and other surfaces. Masonry: Apply cleaners and sealers to concrete, brick, stone, slate, and other masonry surfaces. Detailers: Apply cleaners, deodorizers and other products to cars trucks and boats. Awnings: Apply awning cleaners and sealants on fabric and vinyl awnings. Kitchens: Apply cleaners, sanitizing products, disinfectants in kitchens, refrigerators and bathrooms. 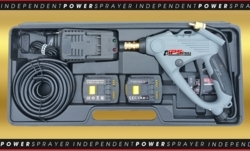 Check out this revolutionary Light Weight Battery Powered Chemical Sprayer For Contractors and stop wasting money and time on pump up sprayers or hauling around heavy 12 volt car batteries! Click Here To Order One Of These Chemical Sprayers Now! Pump Rebuild Kit for IPSPro Chemical Sprayer This Pump Rebuild Kit for IPSPro Chemical Sprayers can be used to replace internal seals that have been damaged by using solvent based products and anything else that might damage the pump. They can be easily installed in about 15 minutes.